Below you fill find all funeral homes and cemeteries in or near Chambersburg. Suburbs of Chambersburg: Aqua, Beautiful, Cheesetown, Clay Hill, Duffield, Franklin Furn, Greenvillage, Guilford, Guilford Sprs, Housum, Jackson Hall, Kauffman, Kerrstown, Kerrstown Sq, Letterkenny Army Depo, New Franklin, Nyesville, Pond Bank, Red Bridge, Stoufferstown, Sunbeam, Turkeyfoot. 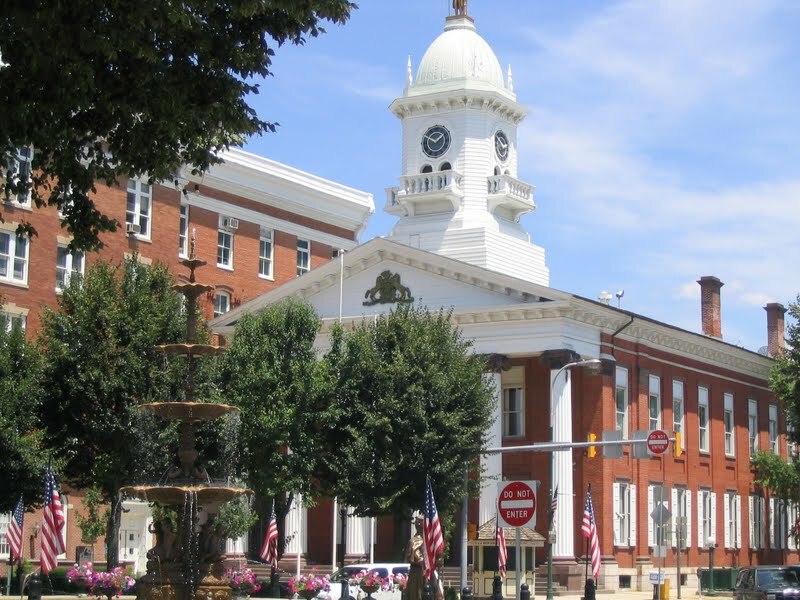 Chambersburg is also known as: Franklin County / Chambersburg borough. Their current mayor is Mayor Darren Brown. Zip codes in the city: 17201, 17202.
y funeral flowers can be purchased from one of the local funeral shops we partner with. There are currently 12 funeral options for this city. Some of the notable people born here have been: Chris Young (actor and television director), Tom Brookens (baseball player and coach), John Putch (screenwriter and actor), Stephen D. Houston (mayanist and epigrapher), Jesse Barton (actor), and Benjamin Jeran McGinn (actor). Chambersburg is a borough in the South Central region of Pennsylvania, United States. It is 13 miles (21 km) miles north of Maryland and the Mason-Dixon line and 52 miles (84 km) southwest of Harrisburg in the Cumberland Valley, which is part of the Great Appalachian Valley. Chambersburg is the county seat of Franklin County. According to the United States Census Bureau the 2010 population was 20,268. When combined with the surrounding Greene, Hamilton, and Guilford Townships, the population of Greater Chambersburg is 52,273. Chambersburg is at the core of the Chambersburg, PA Micropolitan Statistical Area which includes surrounding Franklin County. The population of the Chambersburg Micropolitan Area in 2010 was 149,618.Chambersburg's settlement began in 1730 when water mills were built at the confluence of Conococheague Creek and Falling Spring Creek that now run through the center of the town. Its history includes episodes related to the French and Indian War, the Whiskey Rebellion, John Brown's raid on Harpers Ferry, and the American Civil War. The borough was the only major northern community burned down by Confederate forces during the war.Chambersburg is located along the Lincoln Highway, U.S. 30, between McConnellsburg and Gettysburg, Pennsylvania and along U.S. 11, the Molly Pitcher Highway, between Shippensburg, Pennsylvania, and Hagerstown, Maryland. Interstate 81 skirts the borough to its east. The town also lies approximately midpoint on US Route 30 between Pittsburgh and Philadelphia with the local geography reflecting both flatter areas like Philadelphia and mountainous areas like Pittsburgh. It was noted on February 15th, 2019 that Nicholas Joseph Saranzak died in Chambersburg, Pennsylvania. Saranzak was 57 years old. Send flowers to express your sorrow and honor Nicholas Joseph's life. It was reported on January 30th, 2019 that Marilyn Elaine Ganoe (Wobbecke) passed on in Chambersburg, Pennsylvania. Ms. Ganoe was 67 years old and was born in Newark, OH. Send flowers to express your sorrow and honor Marilyn Elaine's life. It was revealed by Sarasota Herald-Tribune on February 26th, 2018 that Marion D Heckler (Heckman) passed away in Venice, Florida. Ms. Heckler was 88 years old and was born in Chambersburg, PA. Send flowers to express your sympathy and honor Marion D's life. It was disclosed by San Antonio Express News on January 3rd, 2018 that Terrence Lee Mish passed away in San Antonio, Texas. Mish was 84 years old and was born in Chambersburg, PA. Send flowers to express your sympathy and honor Terrence Lee's life. It was disclosed by Orlando Sentinel on July 27th, 2017 that Diane Hardwich (Pearce) died in Tavares, Florida. Ms. Hardwich was 72 years old and was born in Chambersburg, PA. Send flowers to express your sympathy and honor Diane's life. It was written on July 11th, 2017 that Lorene A Mangrum perished in Chambersburg, Pennsylvania. Mangrum was 95 years old and was born in Ore City, TX. Send flowers to express your sorrow and honor Lorene A's life. It was noted on June 25th, 2017 that Beverly Ann Rosenberry (Diehl) died in Seminole, Florida. Ms. Rosenberry was 74 years old and was born in Chambersburg, PA. Send flowers to express your sympathy and honor Beverly Ann's life. It was disclosed on March 26th, 2017 that Joyce Kiskaddon (Magness) passed on in Chambersburg, Pennsylvania. Ms. Kiskaddon was 99 years old. Send flowers to share your condolences and honor Joyce's life. It was written on March 9th, 2017 that Howard M Dr Lebow passed away in Chambersburg, Pennsylvania. Lebow was 64 years old and was born in Bronx, NY. Send flowers to share your condolences and honor Howard M Dr's life. It was revealed on February 24th, 2017 that Colin Vivian Thomas "Tom" Gallagher passed away in Chambersburg, Pennsylvania. Gallagher was 69 years old and was born in Kent E, . Send flowers to express your sorrow and honor Colin Vivian Thomas "Tom"'s life. Benjamin Chambers built a private stone fort during the war, which was equipped with two 4 pounder cannons and fighting occurred nearby. James Chambers fought for seven years during the revolution, reaching the rank of Brigader General. In 1744, it was completed through Harrisburg, Pennsylvania Ferry, Carlisle, Pennsylvania Shippensburg, Pennsylvania and Chambersburg to the Potomac River. The John Forbes (General) Road and other trails going to Fort Pitt (Pennsylvania) Pitt passed nearby as well. Chambersburg is a Borough (Pennsylvania) in the South Central Pennsylvania Central region of Pennsylvania, United States. The official website for the city of Chambersburg is http://www.borough.chambersburg.pa.us/. Funeral services will be held at 1 p.m. Wednesday ... Memorial contributions may be made to Lutheran Home Care and Hospice, 2700 Luther Drive, Chambersburg, PA 17201. Born Jan. 25, 1942, in Chambersburg, Pa., he was the son of the late George Stewart Klenzing ... Services will be Wednesday, Nov. 3, 2010, at 11 a.m. at Donald Edwin Thompson Funeral Home Inc., 13607 National Pike, Clear Spring. The Rev. Dr. Neal O. (Mayer) Warner, 90, a resident of Falling Spring Nursing and Rehabilitation Center, Chambersburg ... in the funeral home. In lieu of flowers, memorial contributions may be made to Trinity United Church of Christ, 30 W. North St., Waynesboro, PA 17268. Listing all funeral homes in Chambersburg, Pennsylvania so you can easily send flowers to any location (same day delivery) or find any funeral service. Find funeral directors & Funeral Directors in Chambersburg, PA. Read business reviews, find driving directions, and more. funeral directors on YELLOWPAGES.COM. Funerals in Chambersburg, PA on Yahoo! Local Get Ratings & Reviews on Funerals with Photos, Maps, Driving Directions and more. Listing all cemeteries in Chambersburg, Pennsylvania so you can easily send flowers to any location (same day delivery) or find any funeral service. We work with local florists and flower shops to offer same day delivery. You will find budget sympathy flowers in Chambersburg here. Our funeral flowers are cheap in price but not in value.